Since 1977, we have taken pride in finding the best commercial construction financing for our clients' needs. Looking for an apartment construction financing or just commercial construction financing? Are you looking to build a retail center, industrial building, office building, or any other type of income-producing property? Our access to over 130 different lenders allow us to shop for not only, the best loan, but at the lowest rate and cost to you. It is important, whether you are a real estate developer or investor, to analyze the profit, loan-to-value ratio, and cost of construction. Whether the developer has a certain percentage of the total cost of the project covered will also play a large factor in obtaining financing for commercial construction. If the more equity is needed, a mezzanine loan is possible. Another important aspect of commercial construction financing is the percentage of the total cost of the project that the developer will cover, usually in the form of free and clear land. Lenders like to see that investors and real estate developers are more invested in their land. In certain cases, lenders will need to determine if the takeout loan is big enough to pay off the apartment construction loan or the commercial construction. This can be calculated in the debt service coverage ratio, which must be larger than 1.25. Based on the proposed payments, the net income from the project must be 25% larger. 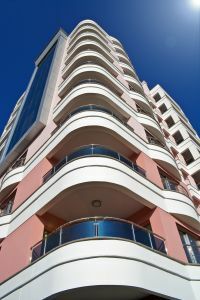 From this value, the commercial construction lender and or the apartment construction lender will examine the developer's net worth to loan size ratio. Ideally, the developers' net worth must be at least the size of the loan amount requested. With commercial construction financing, you want to work with the best and most experienced to help to you attain the necessary financing in sufficient time. Another question one might want to pose if whether or not the commercial construction lender will be able to leave the deal once the commercial building produces enough money to qualify for a takeout loan that is larger than the construction loan. When you are ready to build that commercial property, rely and trust the best. For over 31 years, Ocean Pacific Capital has specialized in commercial construction financing. Call us or email us today to see how we can surpass your expectations. We'll get the job done.